We are pleased to publish the second Brief of a series drawing on the project ‘Diverging Capitalisms? Britain, the City of London and Europe’, led by FEPS, Policy Network and SPERI. In this Brief Lucia Quaglia, University of York, and Waltraud Schelkle, London School of Economics, provide new insights on how fragmented political and economic interests, both internationally and intra-nationally, have been shaping EU economic policy-making in the wake of the global financial crisis, the Eurozone crisis and the UK’s referendum on EU membership. It transpires that playing the ‘two-level game’ of EU and national politics has become extremely perilous and that integration and disintegration are taking place in parallel. 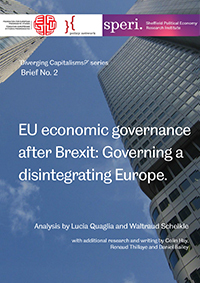 The findings presented in this Brief take the analysis developed as part of the workshop entitled ‘Diverging Capitalisms, Part 2: Brexit and new EU economic governance’ held in London in October 2016.